Properties of Acetone: Volatile, highly flammable liquid; characteristic odor; pungent, sweetish taste. Uses: Solvent for fats, oils, waxes, resins, rubber, plastics, lacquers, varnishes, rubber cements; extraction of various principles from animal and plant substances; in paint and varnish removers; purifying paraffin; hardening and dehydrating tissues. 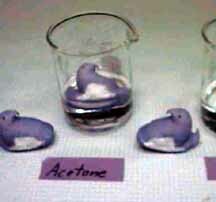 As you can see, Peeps seem about as happy in acetone as they are in water. Perhaps this is a result of natural selection. One could speculate, for example, that long ago the Peep population was located in an industrial area (one of the long-standing Peep mysteries is that they seem to be unusually well adapted to urban areas, while Peep populations in the wilderness are more sparse). Perhaps the earliest Peeps settled in or near a nail polish removal plant. Young Peeps who were born without acetone resistance may have dissolved immediately, allowing only the acetone-resistant members of the species to live into adulthood and reproduce.